FOUNTAIN VALLEY, Calif., Nov. 9, 2016 — The 91st Pedego® Electric Bikes store is opening, and Rancho Santa Margarita is abuzz with excitement at being the chosen location in South Orange County, Calif. Locals who may have tried the bikes at nearby beaches will soon discover how well they also perform on the region’s hilly rural bike paths. Electric bikes flatten hills, so charging up the steepest path won’t exhaust riders who are out to enjoy exercise disguised as fun while they enjoy the area’s beautiful vistas. Pedego Rancho Santa Margarita (RSM) is bringing the fun home with a convenient location in the heart of town. 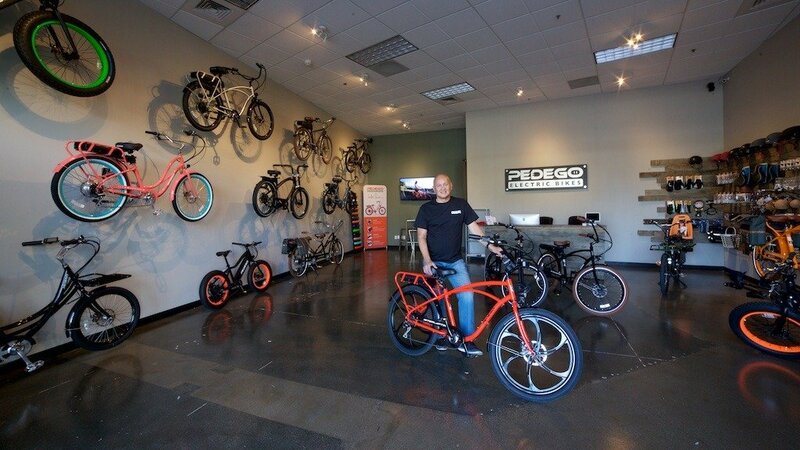 This is the sixth Orange County store for Pedego, the nation’s market leader in electric bikes. To commemorate the occasion, Pedego RSM is hosting a Grand Opening celebration on Sunday, Nov. 20, from 12:00 to 4:00 p.m. The public is invited to enjoy free test rides and refreshments. Other activities include a raffle and special deals on accessories with the purchase of a bike. First prize for the raffle is a Pedego Comfort Cruiser, a fun 1950s-style “pedal or not” cruiser that lets riders ride longer, farther and faster. WHEN: Sunday, Nov. 20, 12:00-4:00 p.m. Free Group ride at 2:00 p.m.
WHO: Allan and Maria Lat, owners of Pedego Rancho Santa Margarita. Don DiCostanzo, CEO, and Terry Sherry, CFO, Pedego Corp.
At the grand opening, Pedego Rancho Santa Margarita will also kick off its Christmas Pedego Comfort Cruiser Give-Away Contest. The Lats fell in love with Pedego electric bikes after they discovered that the company’s commitment to customer support was far superior to any other brand on the market. As with most Pedego stores, Pedego RSM is offering sales, rentals and guided tours on Pedego electric bikes. A specialty that sets apart Pedego RSM will be the two-hour guided off-road tour, available by appointment. The rate for this spectacular tour is $60 per rider. Pedego RSM is the region’s premier dealer in Pedego electric bikes. With their whisper-quiet motors and powerful lithium ion batteries, Pedego bikes flatten hills and make headwinds a breeze, so riders can enjoy more miles and reach destinations with a smile. Located at 30092 Rancho Santa Margarita Parkway, Suite L1, Pedego RSM provides test rides, sales and service as well as rentals and guided tours. Call 949 635 8160 to arrange a free test ride. Visit PedegoRSM.com or email [email protected] to learn more about how these bikes can help you feel like a kid again. Pedego RSM will help you discover the thrill of zooming uphill!